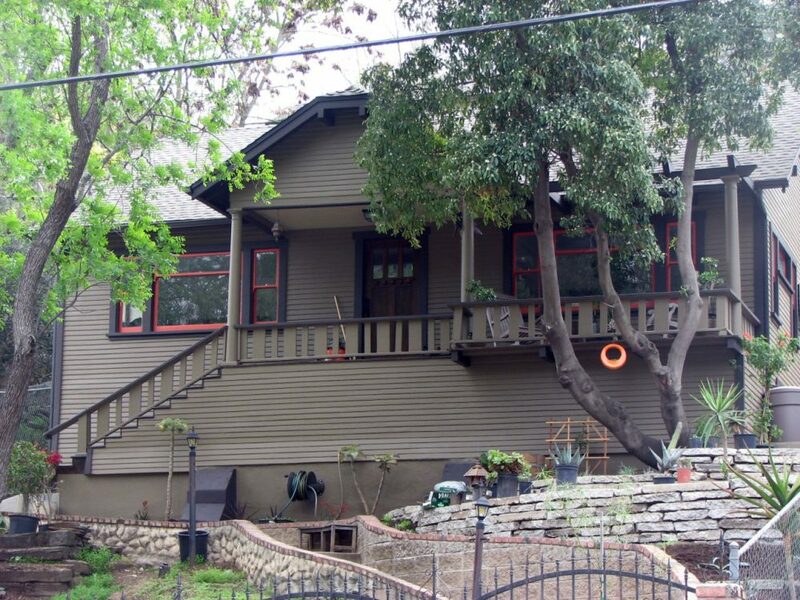 The owners of this 1909 Craftsman on Mount Washington, which is a Historic Cultural Monument, wanted to add a detached art studio to the rear of the house. Neither of the owners were unbendable when it came to the style, so modern architect Nick Corsini designed a studio that, in his words “would create a dialogue between the buildings and the site.” The use of simple building materials achieved the desired effect and honored the craftsman ideal of simplicity. Simple concrete blocks helped alleviate the need for heating and cooling systems and in Corsini’s words “the rust pallet created a warm relationship with the existing house.” A butterfly roof made of corrugated steel strongly reflects the eaves of the house and clerestory windows allow natural light to permeate the space. Utilitarian built-in cabinets are made of okoume plywood, which also lines the ceiling. The final product is definitely modern, but also reflects the craftsman vision. The sensitive addition to this property that honors the past and salutes the present is truly deserving of the 2014 award. This Dutch Colonial was returned to its former dignity by removing inappropriate stucco and replacing the original windows. The redwood siding was able to be saved but the upper shingles had to be replaced. The only thing that remained of the windows were the original openings. Period appropriate window sashes were salvaged and the two bay windows were created around them. All the double hung windows and frames had to be replicated. A similar house showed two diamond shaped embellishments on the upper story which the owner chose to duplicate. A light tan and white combination cover the house and a beautifully landscaped yard surrounded by a white picket fence have returned the turn-of-the-century house to its original state. 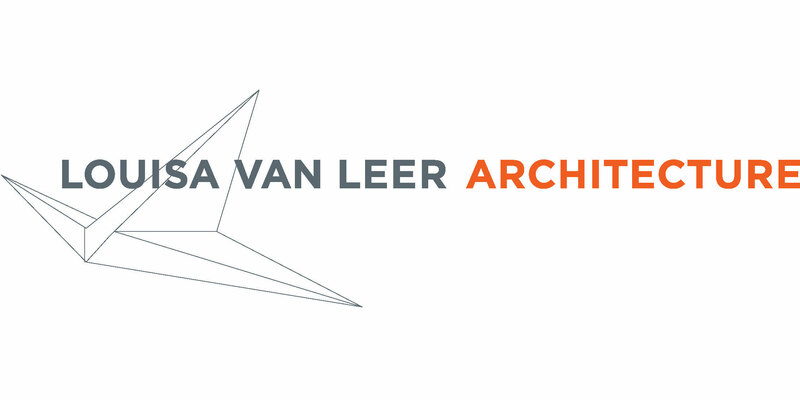 The commitment and dedication of the owner to architectural accuracy is truly commendable and very deserving of the 2014 award. According to the owner, this property looked almost abandoned when he purchased it. The yard was badly overgrown and the house begged for a paint job. After much scraping, an arts and crafts green now covers the large Craftsman which exhibits both a dormer and a gable on the front and two side facing gables which are all embellished with curved knee braces. The transverse gables on either side are slightly cantilevered over the first story. Several casement windows have four lites over one with dark green frames and white sashes. The front porch is highlighted by decorative tiles on the risers. 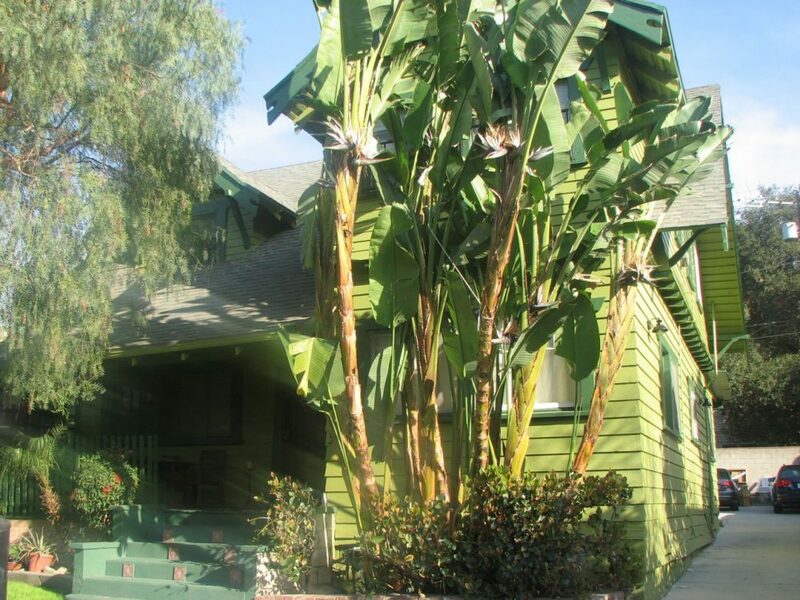 A beautiful pepper tree is once again visible and a gigantic bird of paradise towers to the second story. 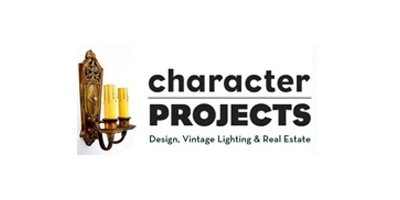 The owner’s pride in his home and his dedication to the historic integrity is truly deserving of the 2014 award. 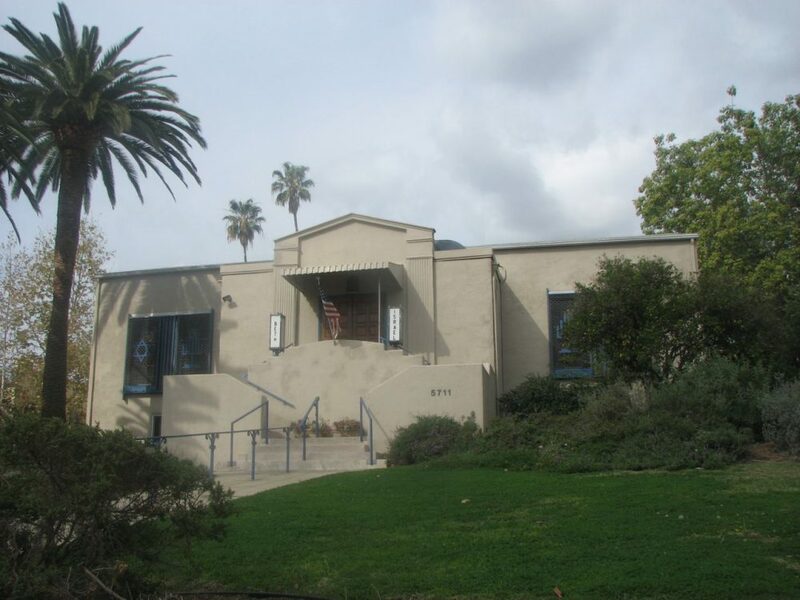 In 1923 a group of a dozen or so eastern European Jewish immigrants had the desire to create a religious center to serve the Highland Park and Eagle Rock communities. For seven years the women rallied together by raising funds, holding services and classes in various locations, and even purchasing a lot on Monte Vista Street in the hopes of realizing their dream. However, by 1930, and the start of the Great Depression, these women were beginning to think all their hard work was for naught. But through determination, encouragement and just plain will power, construction of Temple Beth Israel began in August 1930 and was officially opened in December of that year. Gerson C. Cohen, a third year architectural student at USC, designed the original building. This temple added to the large number of churches that Highland Park had and still does to this day. The simple modern structure is symmetrical and exhibits two pilasters on either side of the front door. 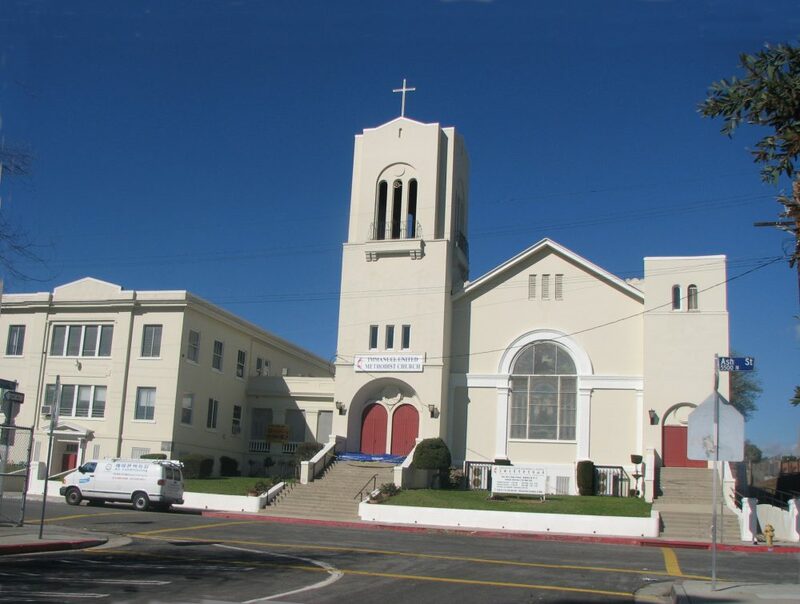 The Temple has been a mainstay on Monte vista for over 80 years and its continued care is to be commended. The 90 years of service to its Jewish congregation and the community as a whole is also to be applauded and is truly deserving of the 2014 award. This studio is a valuable cultural resource in the Highland Park neighborhood. In the last 12 years it has presented over 300 shows in the Northeast L.A. area that primarily focus on Latino artists of Mexican and Central American descent whose work has not been represented in mainstream galleries. As stated on the studio’s website, “the showing of multicultural arts on a monthly basis in a working class community can go a long way in educating people to the importance of diverse art in our lives.” In addition to exhibiting works of art, the studio conducts monthly poetry readings for community members and guest poets to read their creations, and holds weekly classical guitar lessons by a master guitarist for beginning to advanced players. The Avenue 50 Studio deserves this 2014 award for its ability “to build bridges of cultural understanding through artistic expressions” that reflect and enhance the Highland Park community. 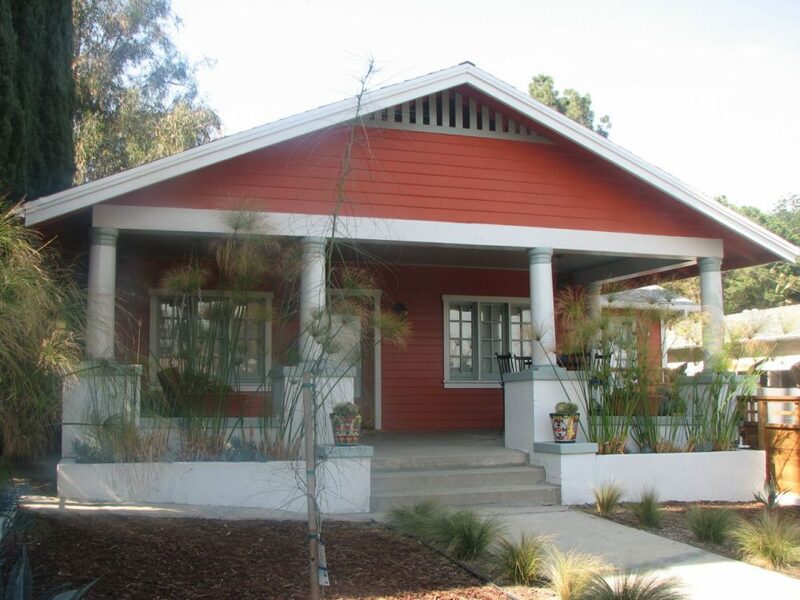 This single story Craftsman sits high above the street and is once again inhabitable after a new foundation, new roof and a welcome paint job. It features an extended porch roof that is supported by two Tuscan columns. The wooden porch is original and the front entrance has been replaced with a period appropriate door. A light and dark brown color palette and orange trim provide the final touches to this attractive home. 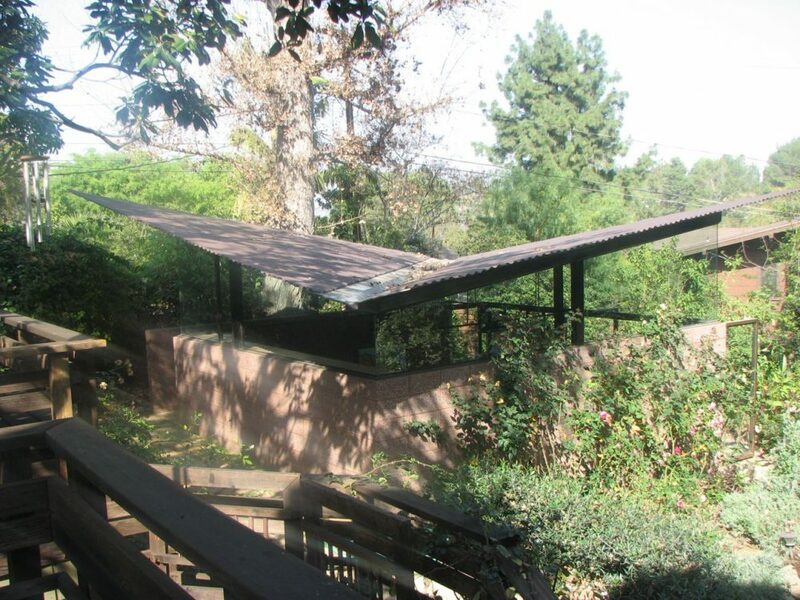 Leading down to the street is the original curved walkway with brick siding and concrete steps. The tremendous amount of work and commitment to renovating the property is commendable and truly deserving of the 2014 award. The restoration of this 1921 cottage turned a dilapidated structure into a preservationist’s delight. The colonial influenced residence features a protruding classical front porch highlighted by four Tuscan columns. The original front door has lites on either side and the concrete front porch has founded edges. The white paint on the small clapboard siding and Tuscan columns is offset by blue and grey trim. The pleasing results of this undertaking display pride of ownership and are definitely deserving of the 2014 award. 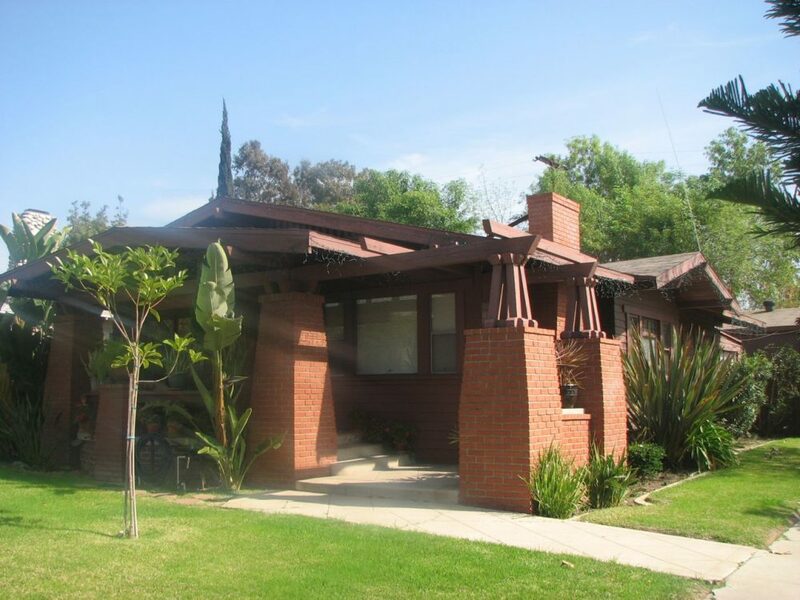 This same home won in 1993 for sensitively restoring brickwork that had been damaged in the 1987 earthquake. Through the years this home has been lovingly maintained and was again nominated this year. This single story Craftsman is highlighted by four large brick piers that support the front entrance. The concrete porch has a rounded edge that sits above a brick foundation. The earth tone that covers the entire house harkens back to the original Craftsman ideal that tried to blend the structure into the surrounding land. The simple elegance of this home has been lovingly cared for and is truly deserving of the 2014 award. 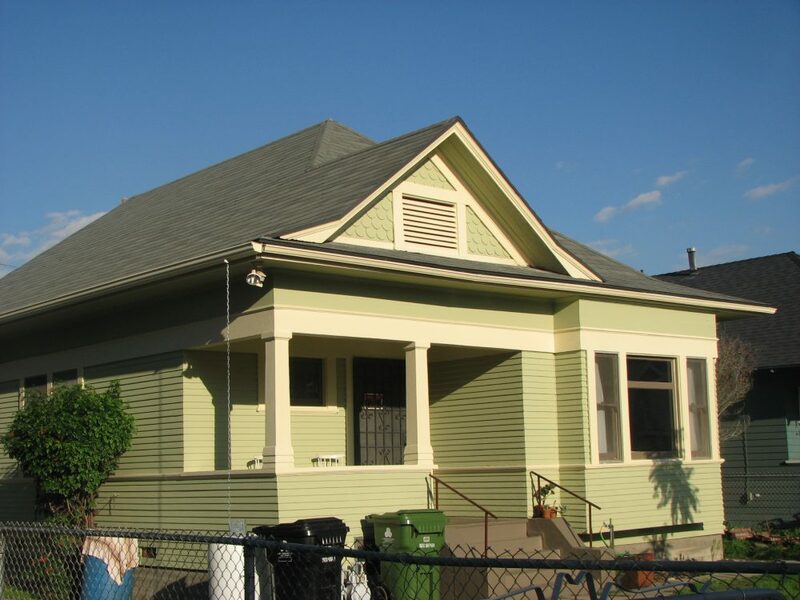 This 1886 Queen Anne Victorian sat vacant and almost invisible for many years. 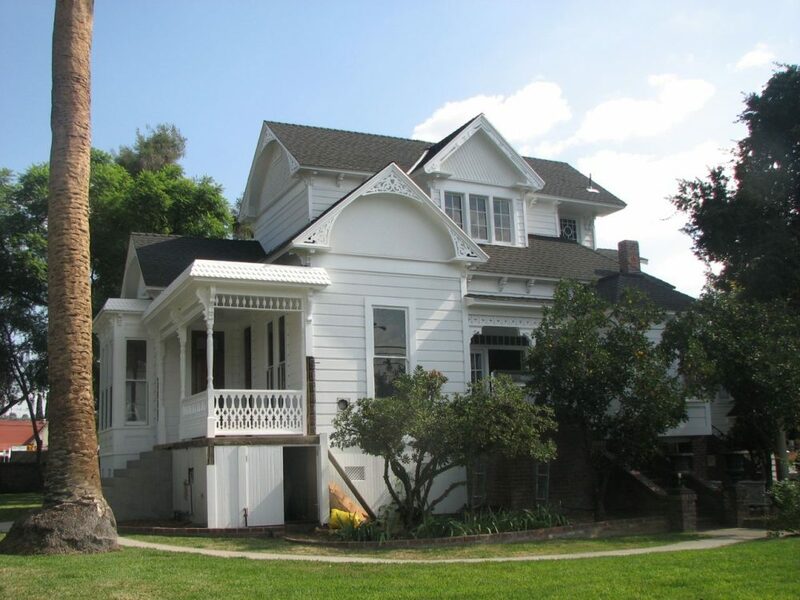 Through the efforts of the Garvanza Improvement Association and the complete dedication of the owner, the Dr. Smith House has been returned to its turn of the century glory. Visible once again are the tall Italianate windows, decorative fretwork surrounding the numerous gables, and the spindled porch columns. The concrete Tuscan columns that lined the main entrance are once again standing proud. A cottage that was built in 1920 was also lovingly restored. The tremendous undertaking that went into the sensitive restoration of one of the highlights of Garvanza is truly deserving of the 2014 award. 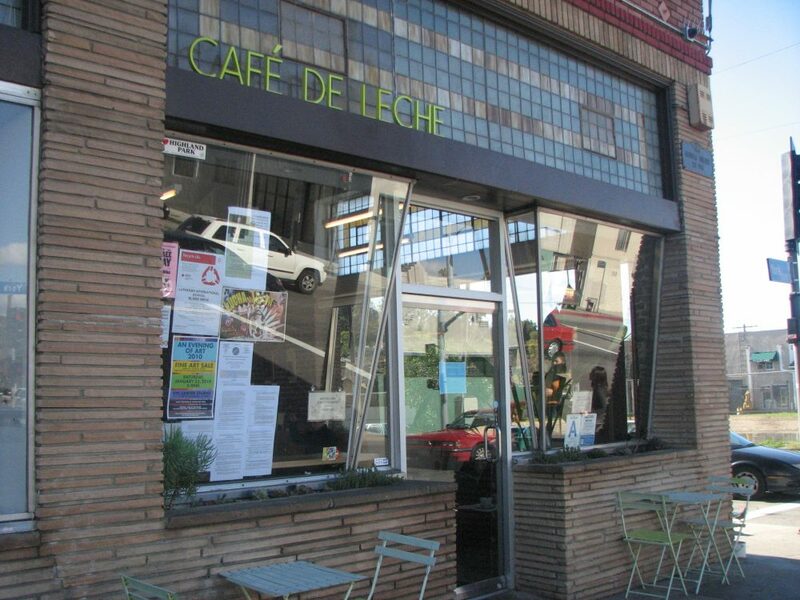 Café de Leche owners Matt and Anya Schodorf have provided a gathering place. In the scheme of things, by being innovative, seeking to use the space to the fullest, uncovering the beautiful amber leaded glass along the top part of the windows, and opening up the interior ceiling and walls to expose the ducts and the brick, they created a space that is welcoming and current in a historic setting. 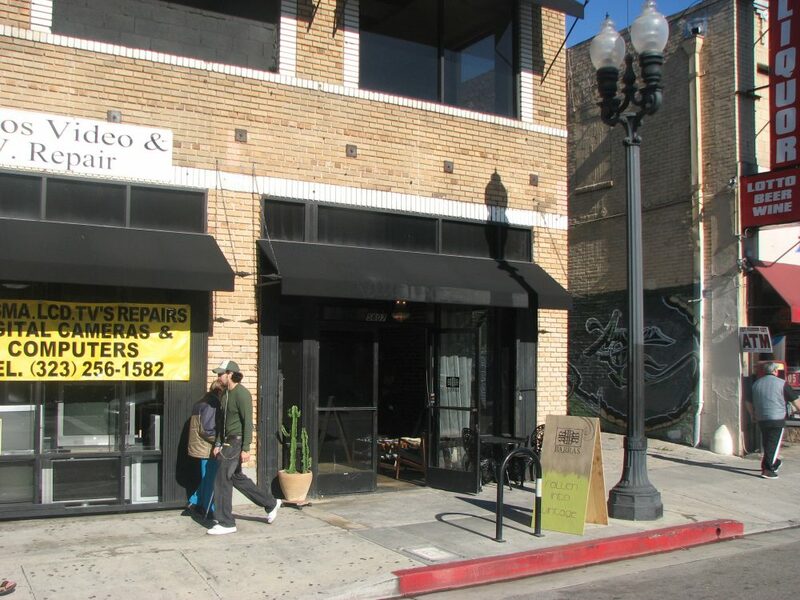 When one enters the Barras Salon they are entering a world of urban chic, right here on Figueroa Street. Mr. Barras took an older building and adapted it to the needs of a contemporary market. He bestowed an urban sophistication on an this structure while being respectful of its historic roots. Barras has been operating his salon for approximately one year. In this short time he has transformed a building that had too many walls, a low suspended ceiling and a linoleum floor into an excellent example of adaptive reuse that respects the architectural integrity of the past and meets the needs of the present. He opened up the space by removing non-historic walls, by polishing the cement floors until they shone, and exposing the original arched windows that show what the building would have looked like even though they are still sealed with cinder blocks. He also revealed the ducts and ceiling joists to give it a more open feeling. Amazingly, he did all of this himself while maintaining a full time job. The tremendous amount of time and energy that went into this adaptive reuse within the heart of the Highland Park Overlay Zone is to be applauded and is well deserving of the 2009-2010 award. The Pisgah Church, also known as Christ Faith Mission, began in 1895 and included eleven historic structures that housed Reverend Finis E. Yoakum and his followers. Pisgah has been a continuous part of the Highland Park community, at times serving the homeless and always a way station for its followers. 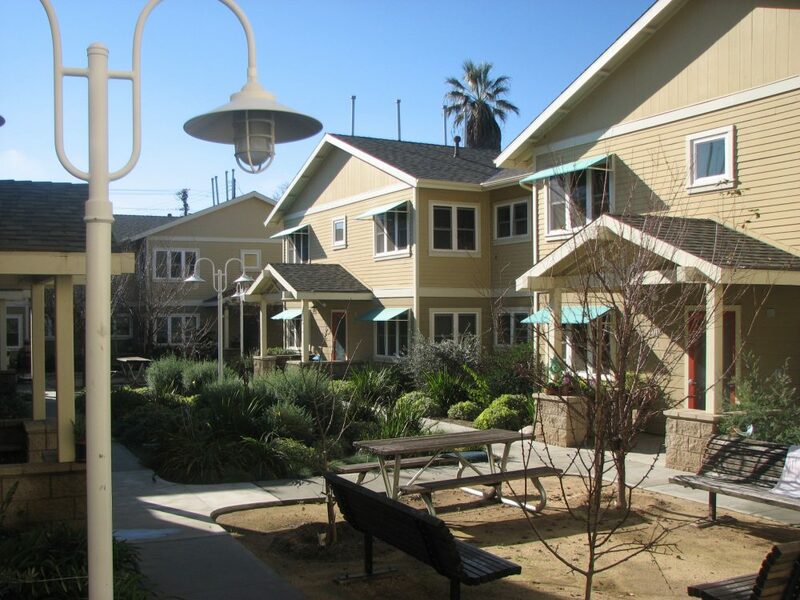 A few years ago it was decided to rehabilitate Pisgah Village and create 47 units of quality, affordable housing. By using irregular massing, low-pitched roofs and the addition of front porches, the new housing blends in well with the neighboring structures and still allows the Pisgah Home to maintain dominance on the site. The new buildings are not only respectful of the existing architectural integrity, but are sensitive to the environment by using finishes and materials that are eco-friendly. In keeping with the historic layout of the property, a lovely, new courtyard was created for the residents and an existing courtyard shaded by a large California Oak was retained. The use of the Secretary of the Interior’s Standards for the Treatment of Historic Properties allowed Pisgah Village to be listed as a National Register Historic District. The tremendous amount of time and energy that went into the project and its sensitivity to the historic fabric is truly commendable and well deserving of the 209-2010 award. 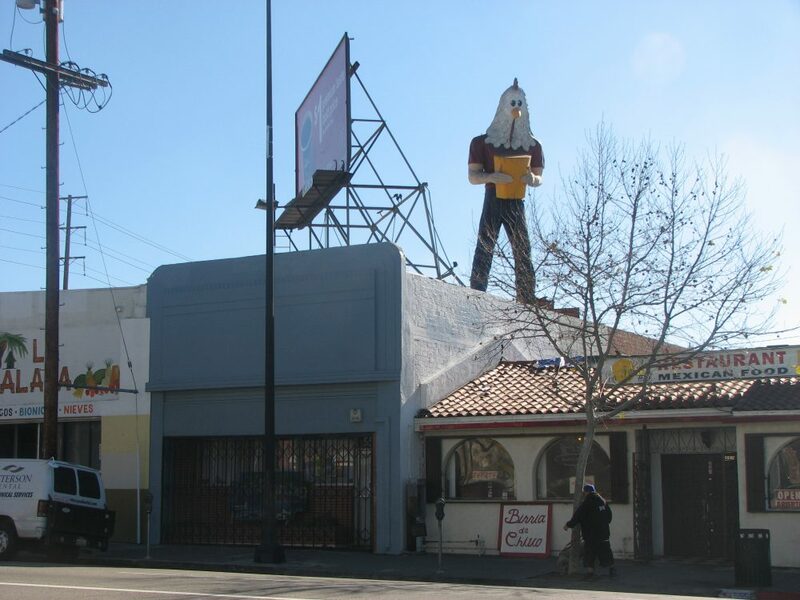 In 1984 the statue of Chicken Boy was removed from the roof over the Chicken Boy restaurant, which had recently closed. Amy Inouye campaigned to save the roadside icon and eventually acquired it and put it into storage. Unable to find a proper new public home for him, he languished in storage for 23 years. 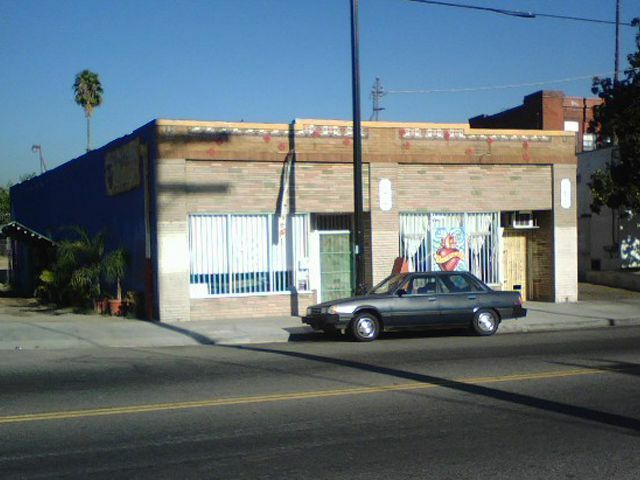 Upon moving to Highland Park, plans and permits were secured to install Mr. Boy on top of her office on Figueroa Street, where he found a permanent roost in 2007. A true grassroots preservation effort, the Story of Chicken Boy won first place as the 2009 California Preservation Foundation’s Three-Minute Success Story. The dedication to preserving this icon on Route 66 – where it originally had its home – is truly commendable and very well deserving of the 2009-2010 award. 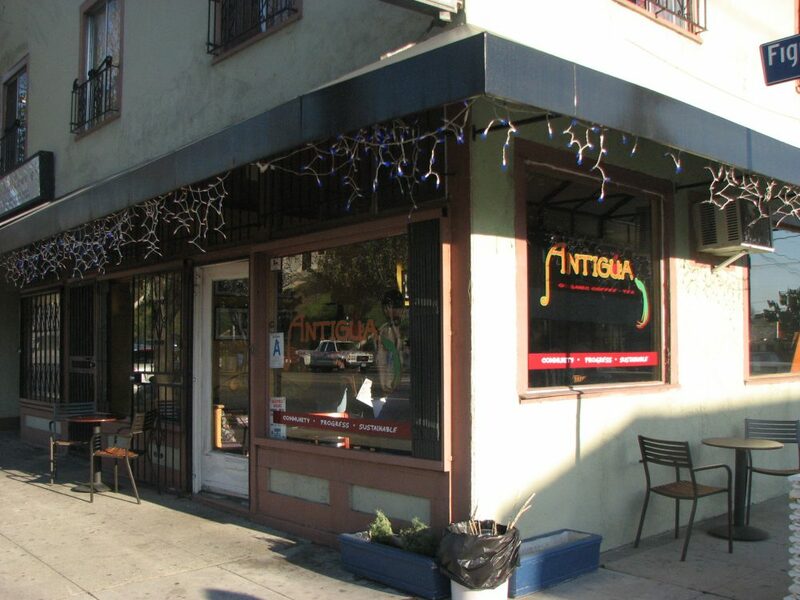 Antiqua Cultural Coffee House has preserved the past while basking in the present. The business owner took a former ice cream parlor that had much of its architectural integrity intact and adapted it to the needs of a community that serves both a grade and middle school. The neighborhood received a much needed eating establishment and the schools acquired a place to gather. This endeavor was a challenging undertaking and is to be commended. The owners’ foresight has preserved the historic fabric of the building and at the same time serves hundreds of students and the residents of the surrounding area. The owner’s actions are to be praised and he is very well deserving of the 2009-2010 award. 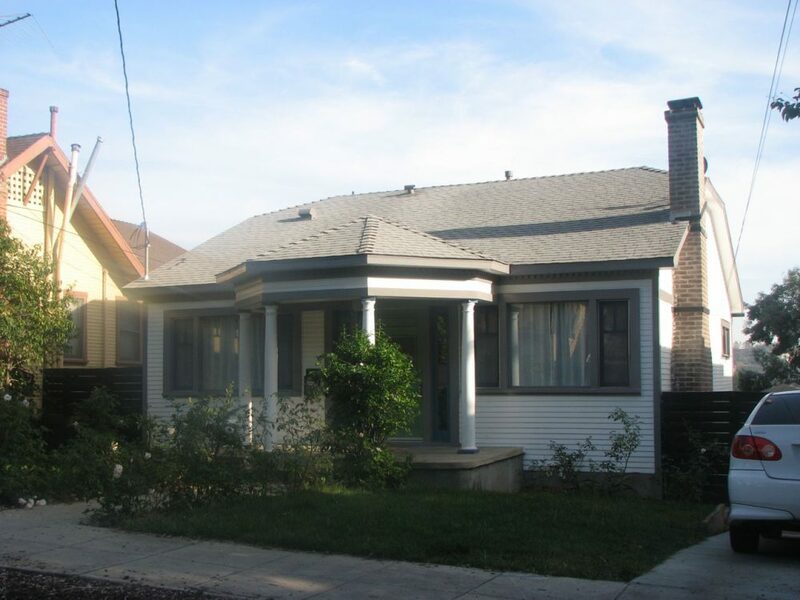 This stately Craftsman is dominated by a handsome concrete porch with two battered brick columns on either end. Above the left side of the porch is a sheltered balcony and a gable on the right side is located above an arbor. The earth tones of the paint scheme are created by seven different shades of brown and aqua marine highlights the window sashes. The color combination gives it a distinctly Craftsman look. A well-maintained landscape and avery attractive parkway boasts drought-resistant landscaping. The upkeep and care displayed by these owners show tremendous pride and is well deserving of the 2009-2010 award. This charming bungalow features a dormer with fish scale shingles situated above the porch and a square bay on the right side of the house. Because of the pyramidal roofline and its massing, this structure can be described as a Pyramidal Folk Victorian. The fish scale shingles are also Victorian. 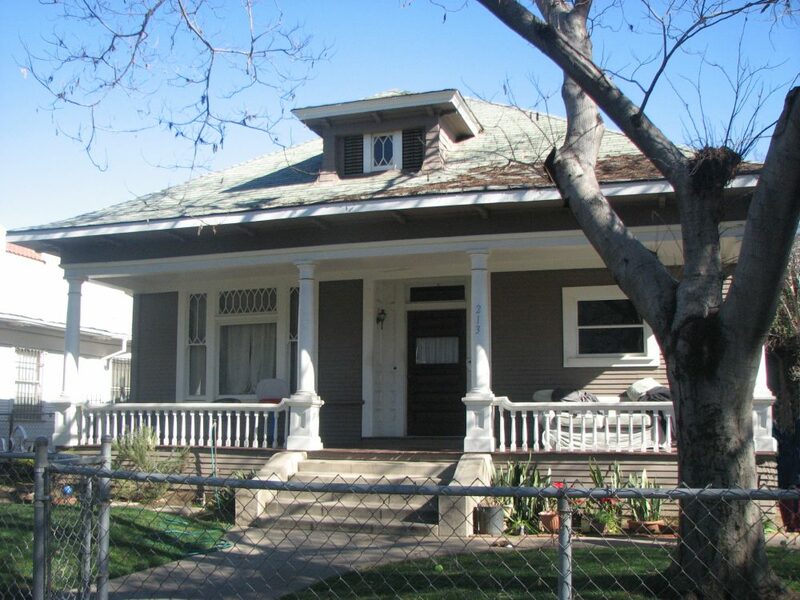 However, its battered porch columns, double frieze and horizontal lines are a definite Craftsman influence. A simple paint scheme has highlighted the many fascinating architectural details and gives the house a new lease on life. The owners’ dedication to their property is quite evident and well deserving of the 2009-2010 award. 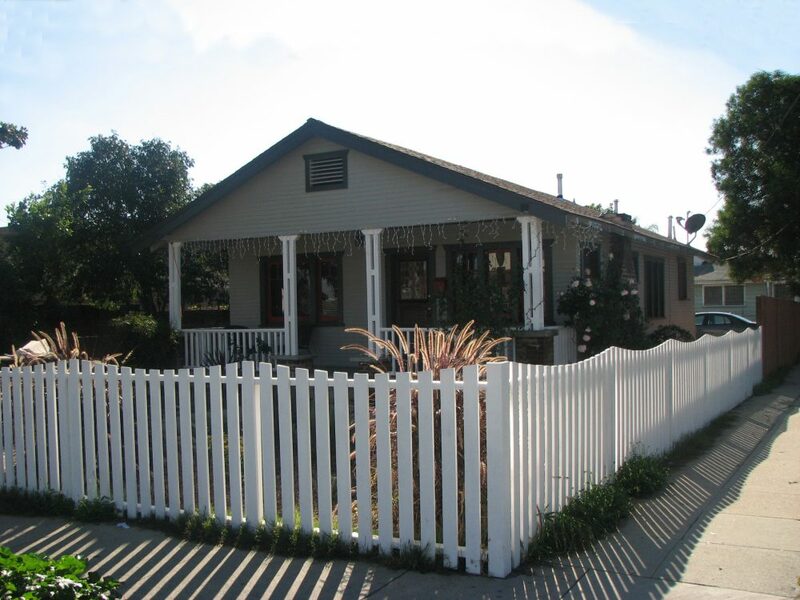 This simple clapboard sided Craftsman went through a complete renovation in 2009. A number of non-historic windows had to be replaced and the porch had to have the original wooden pillars and railing duplicated. 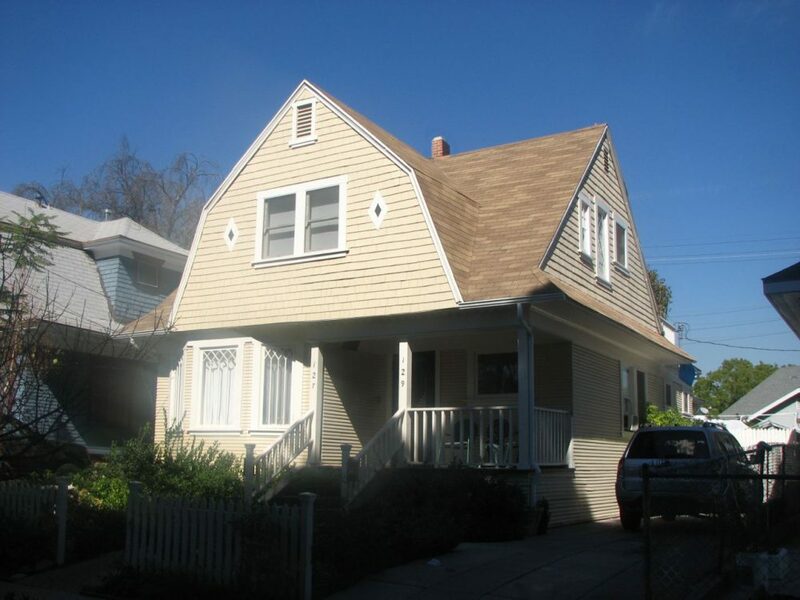 An illegal addition was removed and the home was returned to its original footprint. An attractive paint scheme was the crowning touch. A chain link fence was replaced by an attractive wooden one and the yard was refurbished with a brick sitting area and pleasing landscaping. The tremendous amount of time and energy that went into the renovation of this house is to be applauded and is well deserving of the 2009-2010 award. This handsome and virtually intact Colonial Revival house is highlighted by a full width front porch with four Tuscan columns and colonial balustrades on the porch railing. The front door is located in a central alcove with a transom above. The wooden door appears original and has dentils below the glass and paneled walls on either side of the alcove. The hipped roof has a central dormer whose single diamond paned window mimics the window on the front porch. A new coat of paint and a well tended fornt yard point to the continued care and maintenance of this home. The pride displayed by the owners is commendable and well deserving of the 2009-2010 award. 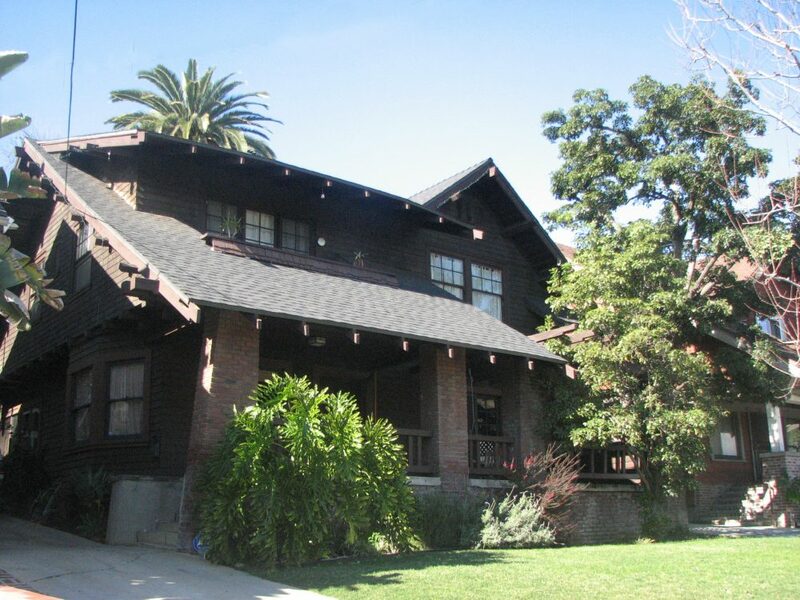 This stately Mission Revival with Gothic influence, has been in the Highland Park area since 1907. An original stained glass window, approximately 12′ high and 6′ wide was installed in 1909. In 1986 the window was cleaned and re-leaded by Judson Studios. The window is covered on the outside to protect it. To behold the architectural integrity of this building is quite amazing. A testament to this are the original hinges that still secure the double arched front doors. A pleasing paint scheme offsets these doors and many other architectural details. The sensitive upkeep of this property and a well-maintained landscape shows tremendous community pride and is very well deserving of this 2009-2010 award.